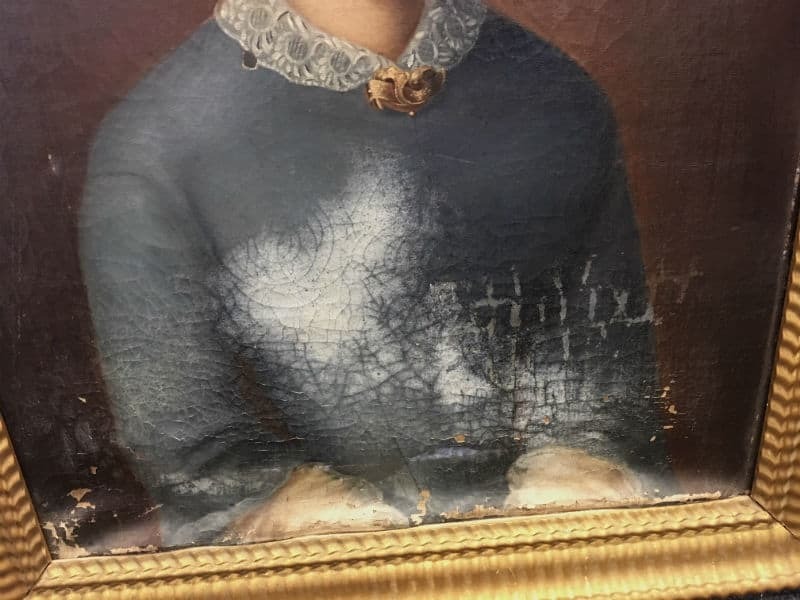 When an oil painting becomes water damaged, deterioration is instant. 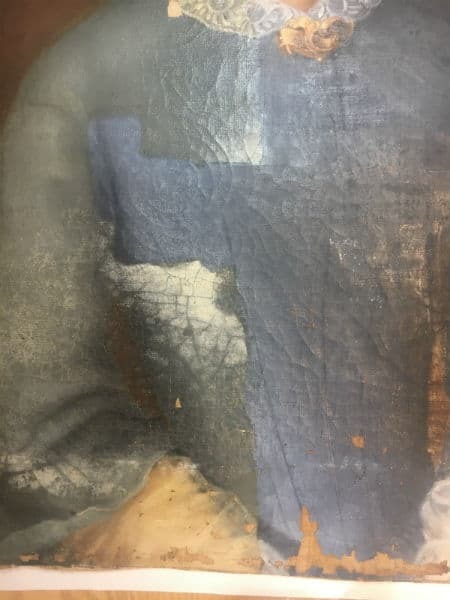 For an 18th century oil painting we have just completed restoring, the consequences of the water infiltration were extensive and immediately evident. 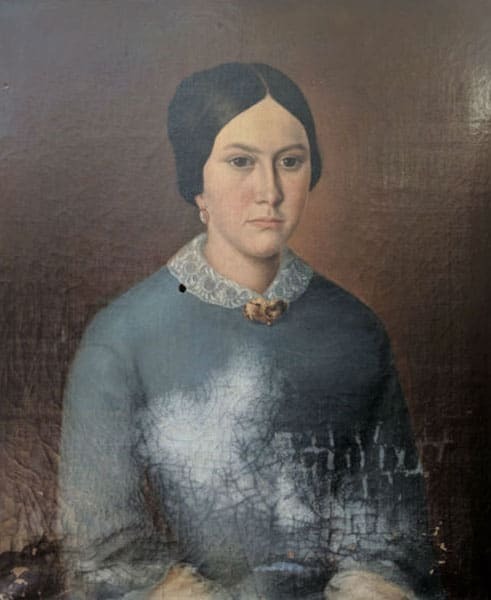 In this case, water has touched the painting at some point over the years, and additional damage has required the need for restoration. Once we had collected the painting, a thorough studio assessment inventoried the multiple areas of damage. It was evident that the water spread from the bottom to the middle sections of the painting, and the top half was spared. 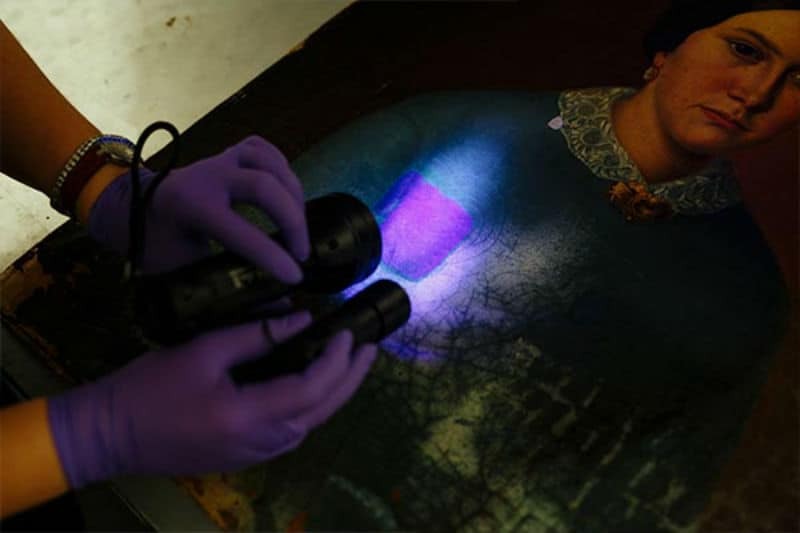 Most noticeably, the surface of the painting had discoloured. 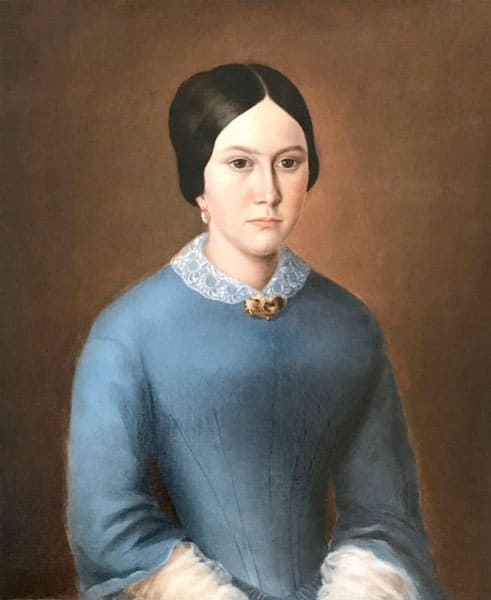 In place of a vibrant blue dress, the colour changed to a murky white. While a varnish acts as protection for the paint layer, being exposed to water will eventually cause the varnish to be penetrated. The white stains are caused by the reaction of the varnish with the water, and is more commonly known as ‘blooming’. 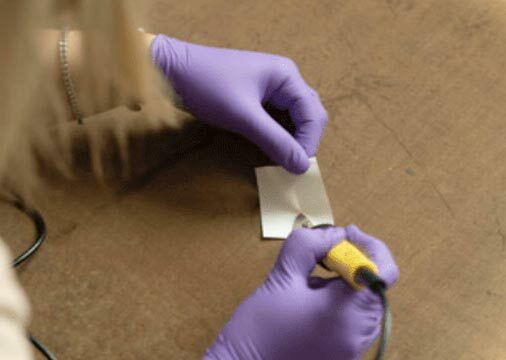 Once the varnish layer has been compromised, the paint is therefore exposed and at risk. There was also a hole in the middle of the canvas, unconnected to the water damage. 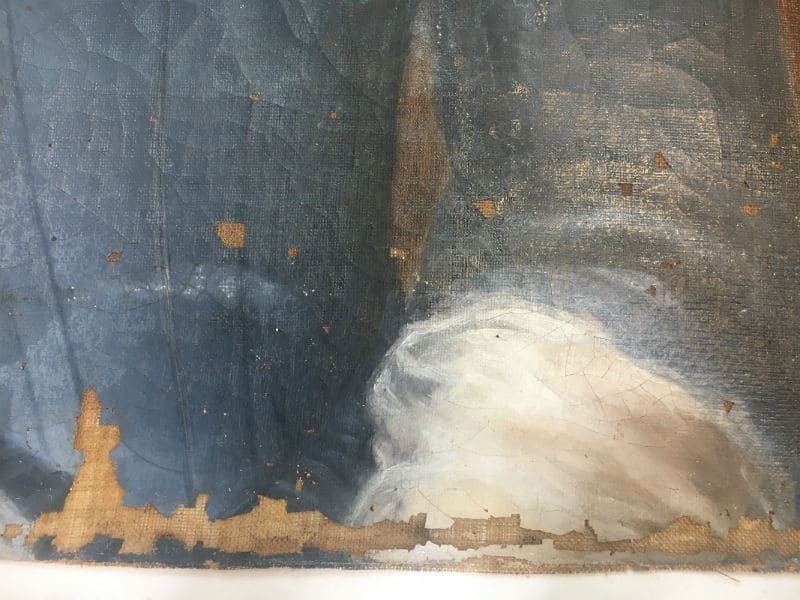 In some particularly severe cases of water damage, the wooden stretcher bars can swell and warp and cause distortions and tears in the canvas. The painting was first removed from the stretcher bars. After damage, they was no longer fit for purpose in supporting the canvas. Due to the degradation of the canvas and its increased fragility, the first treatment for the painting was re-lining using BEVA 371. Applying a new canvas to the back of the painting would provide the necessary strength and support in conjunction with procuring new wooden stretcher bars. 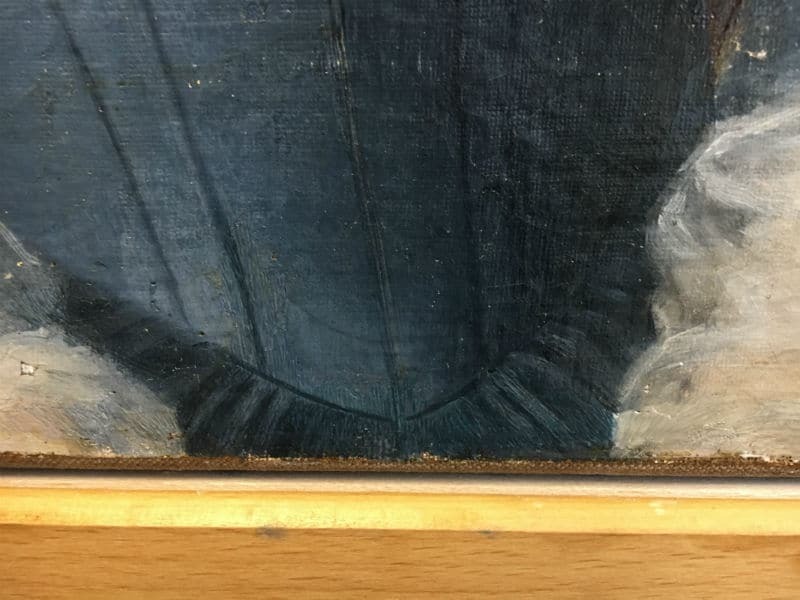 Re-lining the canvas also allowed the hole at the subject’s collar in the painting to be stabilised. Unlike with most tears, the canvas at the point of impact was no longer attached, so the fibres could not be brought back together. The uncleanliness of the water and years of general dust and dirt accumulation consequently caused the painting to require an intensive clean. The solution to counteract this build up was ethyl alcohol and white spirit. As you can see from the pictures and video below, it was incredibly effective. After cleaning, the painting was re-stretched over new stretcher bars. 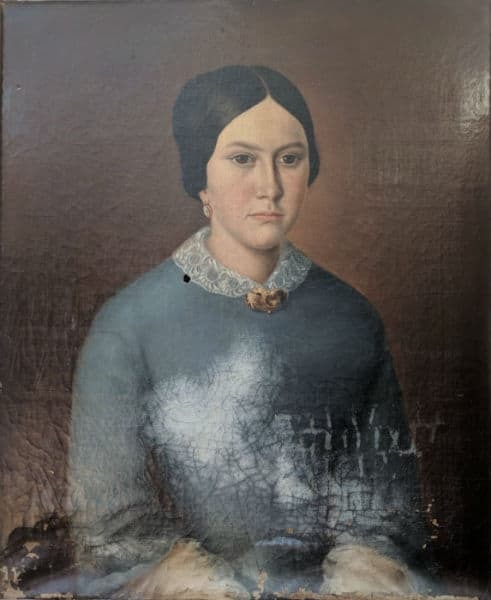 The flaking paint at the bottom of the canvas was consolidated by injecting a thermoplastic consolidant with a syringe underneath the affected areas, and re-adhering to the canvas with a hot spatula. As a result of some of the paint layer being lost, many gaps were left that required retouching. A filler was first applied to these areas, comprising chalk and glue. By matching against the original pigments, we carefully colour matched and re-touched these areas. The same process was applied to the new canvas area where the hole was stabilised. The finishing touch for the portrait was the application of a layer of varnish. The varnish acts as protection for the paint layer, guarding against intrusive dirt and dust. It also evens out a painting’s final appearance for a uniform glossy or matt appearance. For this painting, it’s a gloss finish. 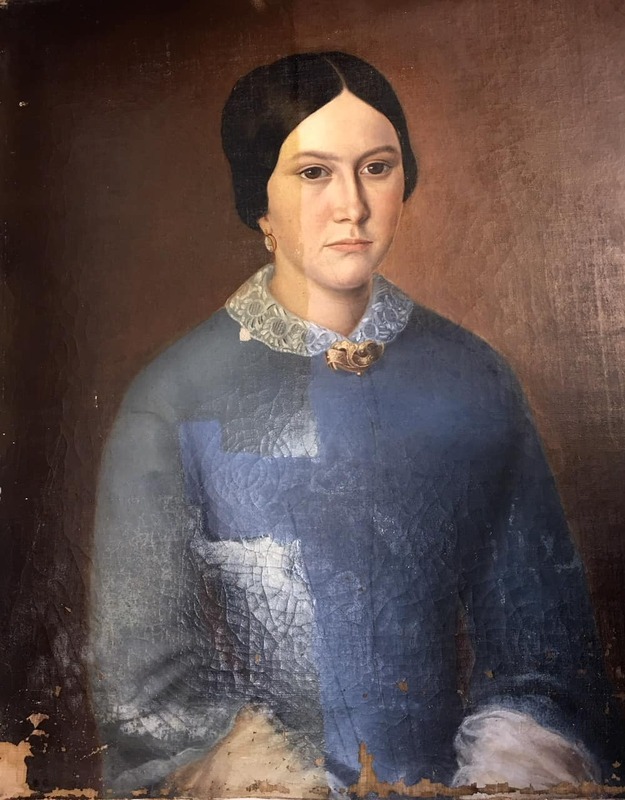 Now the painting has been finished, the contrast before and after restoration is striking; the damage has been treated without any trace and the vibrancy of the the revived colours are restored. The painting was then returned to our pleased client, to be enjoyed for the years to come.